Highly skilled sewing operators producing a wide variety of products. Team sewing with 6 to 30 operators in a team. Operators cross trained to handle up to 3 operations in a module. Well maintained equipment with an inventory of all types of mechanics to provide flexibility and capacity in line set-ups. Operators are part of an on site education program for technical skills conducted in conjunction with government agency. 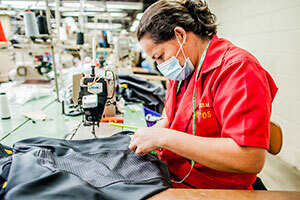 Our team sewing emphasizes low in-process inventories and quick thru-put time. Ability to quickly change styles in sewing line. Technical teams are available for training. Our goal to assure that your product meets or exceeds your quality expectations. Quality audits performed in all processes starting with fabric and trim inspection, down to cut parts prior to their production. All sewing lines have continuous in line audits and final audits of all production. Final audits prior to shipping performed by certified Final Auditors. Documentation of all audit results to assist in timely and relevant feed back. Dedicated staff that is constantly undergoing training in new techniques. Certified manufacturer for Nike, Reebok, Adidas, UA, and Skins. Continuous program of education to help employees develop skills. Programs include technical and personal subjects. Activities scheduled through-out the year to motivate and entertain employees.